That frustration had boiled over in other cities. A bullet sliced through the air. 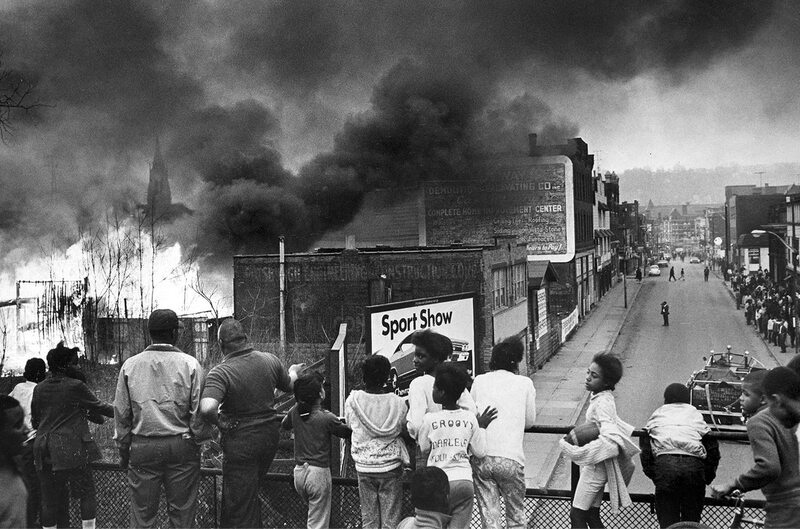 MLK's assassination ignited anger in Pittsburgh that had simmered for years. Those who lived it tell their stories. 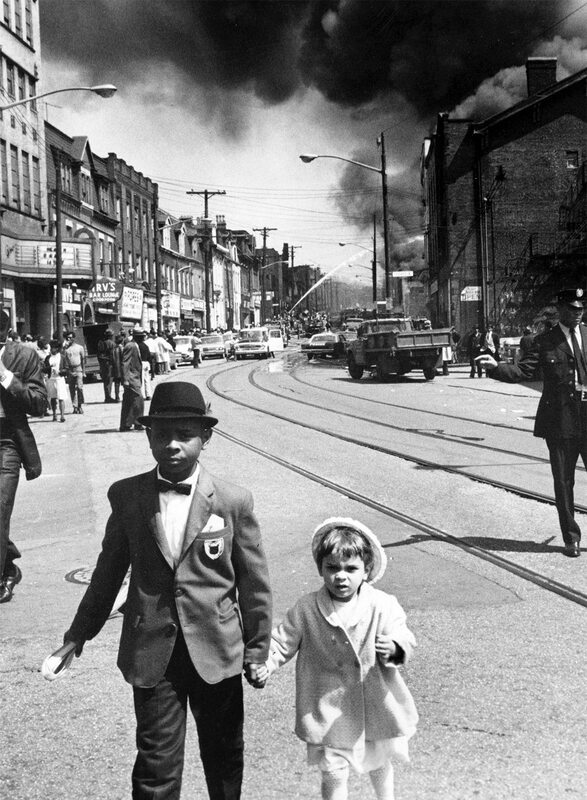 Two young children walk through the Hill District on Palm Sunday as smoke from the Mainway Super Market billows behind them during the unrest following the April 4, 1968 murder of civil rights leader The Rev. Martin Luther King Jr.
Frank Cissell, a skinny 17-year-old with a 3-inch Afro, flared pants and Chuck Taylor tennis shoes, spent the early evening of April 4, 1968, listening to a stack of 45s in the basement of a girlfriend’s house on Caldwell Street in Pittsburgh’s Hill District. Martha and the Vandellas. Marvin Gaye. Frank loved anything from Motown. 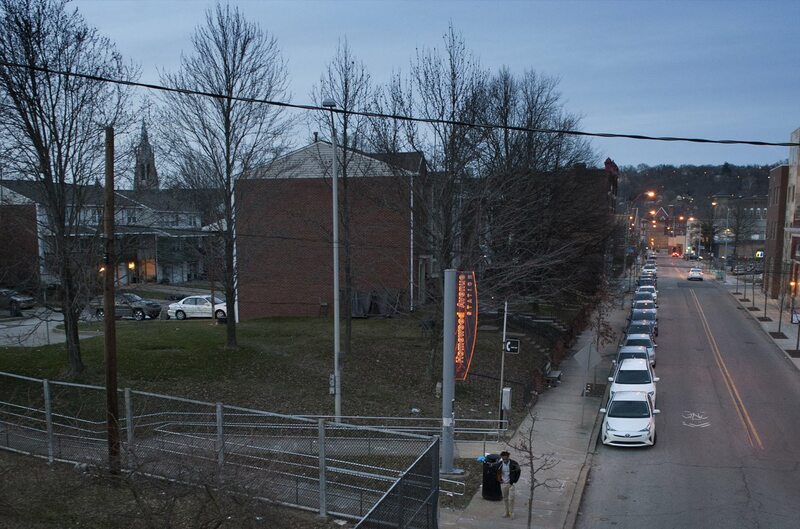 As darkness settled, Frank walked to Centre Avenue and Crawford Street to catch a bus home to McKees Rocks. The intersection was quiet. St. Brigid Church (now St. Benedict the Moor) loomed above. Below, Frank could see the Civic Arena, squatting like a giant overturned steel bowl in an oversize parking lot. A police car pulled up. “Move it,” an officer said. “I’m waiting on my bus,” Frank said. Frank was confused. The officer bolted out of the patrol car and Frank felt a nightstick smash against his head. Dazed and bleeding, he began moving down Centre. “What’s happening?” he wondered as he staggered past the arena. Inside, 24-year-old Richard Gillcrese and about 3,000 others watched a bruising basketball game between the Pittsburgh Pipers and the Minnesota Muskies. Richard worked for an organization called Urban Youth Action, and spent his days helping kids become “work-ready” and community-minded. Now he was relaxing with friends and enjoying some American Basketball Association playoff action. Five miles east, in the basement of a home on North Lang Avenue in Homewood, Tamanika Howze gathered with a few other young women who’d formed an organization called Black Sisters United. They sat on couches and chairs and discussed ways in which they could improve life in their community. 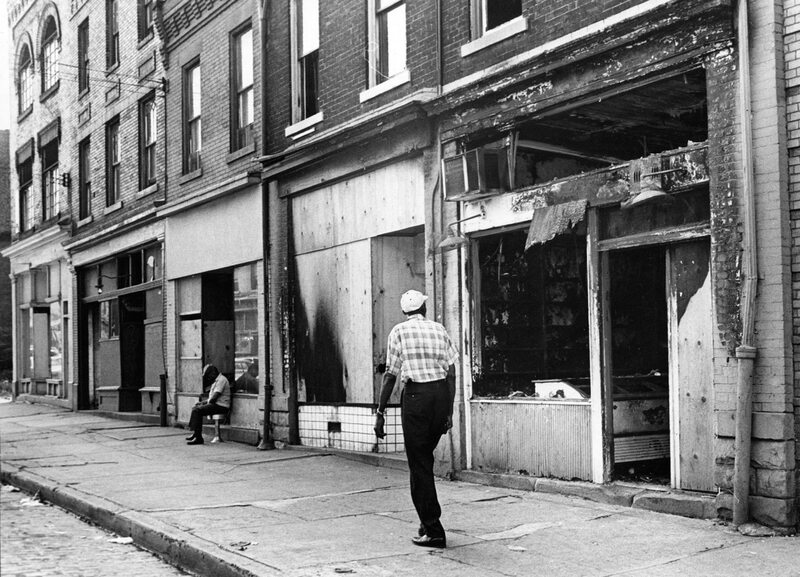 At 19, Tamanika knew firsthand the treatment blacks received in Pittsburgh. 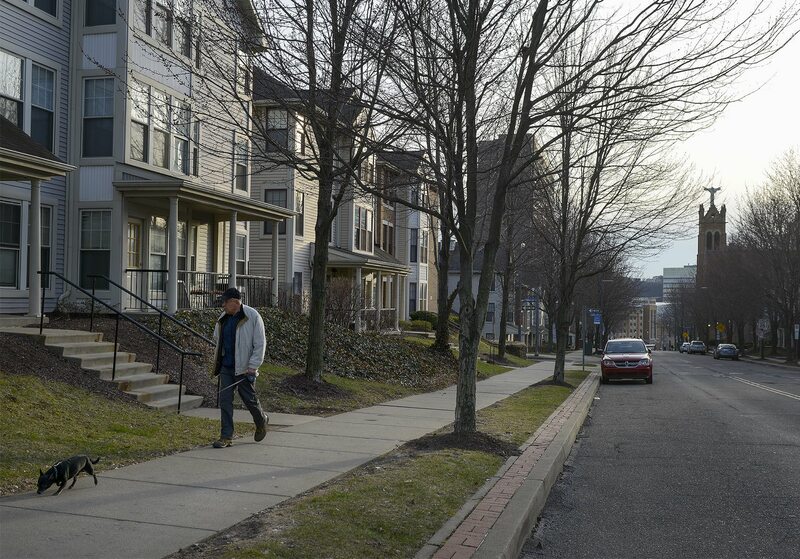 She’d learned from a young age to stomp her feet when entering the kitchen of her family’s Tannehill Street apartment in the Hill -- the noise scared away rats. The landlord, she says, never responded to requests to end the infestation. In elementary school, during the reading of “Little Black Sambo,” a school librarian asked a black student to run in circles. When he fell over from exhaustion, the librarian burst out in laughter. Blacks were fed up. In March 1967, Tamanika was moved by Stokely Carmichael’s speech at Ebenezer Baptist Church about Black Power. She stopped straightening her hair and by the next year she and her friends had organized themselves. Television sets flickered and glowed throughout the city. Viewers on Thursday night gravitated to magical shows — Sally Field floating skyward in “The Flying Nun,” Elizabeth Montgomery twitching her nose in “Bewitched.” Shortly after 7 o’clock the magic ended. Pittsburgh Post-Gazette front page, Friday, April 5, 1968. “Don’t play with us like that,” the young women called back. But when he yelled out twice more, Tamanika and her friends climbed the steps and saw the TV reports. “We just looked at each other in dismay, hurt, anger, disbelief, pain,” Tamanika recalls. In Oakland, Ralph Proctor rose from his chair in a Howard Johnson’s hotel restaurant and headed toward a TV in the bar. He’d just heard something about the Rev. Martin Luther King Jr. He hoped he’d heard wrong. In a brick home on Ewart Drive in the upper Hill, 10-year-old Charlene Foggie heard the jarring ring of the telephone in the kitchen. Her mother answered. Moments later, Madeline Foggie walked into the living room and sank onto a couch. Dish towel in hand, she ditched her normally ladylike posture for a slump. “Come here,” she said, then wordlessly held her daughter close. Less than a mile away, at the University of Pittsburgh, news of the Rev. King’s death jolted a tight-knit community of African-American students. They’d already been discussing change. Blacks were a tiny fraction of the school’s enrollment and saw few, if any, blacks among Pitt’s faculty or administrative staff. Tony Fountain, then a sophomore, knew that even blacks with degrees faced harsh limitations. His father had earned a master’s degree at Pitt but spent his days swinging a mop, picking up trash and cleaning toilets in places where he’d once studied. Morris Fountain was a University of Pittsburgh janitor. Shocked, dismayed and angered at the news of the Rev. King’s death, Tony and other black students gathered in a Craig Street office. They decided they needed an organization focused on action and results, not talk. “Let’s call it the Black Action Society,” said Curtiss Porter, a senior from Braddock. He, Fountain, Jake Milliones, Margaret Dobbins and several others began crafting a plan. Frank Cissell held a bloody T-shirt against the gash on his head as he made his way Downtown. There, he saw people crying. Someone said the Rev. King had been shot. Now Frank understood. Police feared the Hill would erupt. At Jenkins Arcade on Stanwix Street, two women asked if Frank was OK, then went into Palmer’s Restaurant to get a clean towel for his wound. 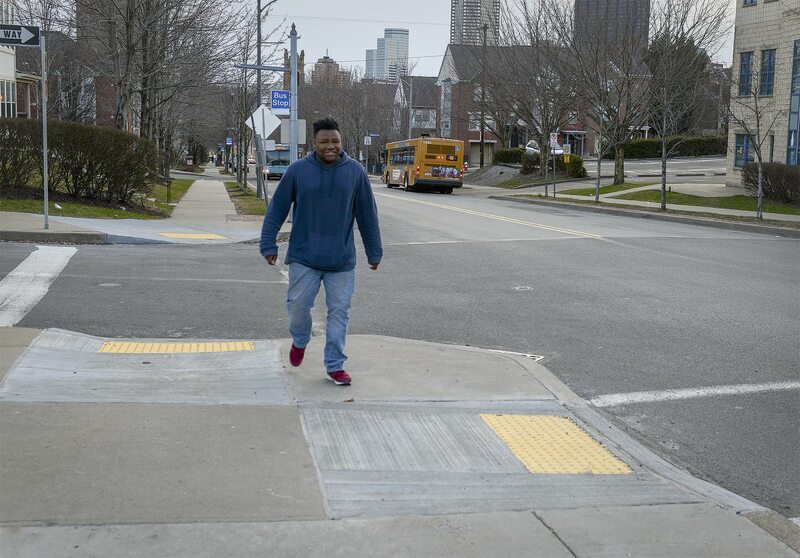 Frank stepped onto a bus headed to McKees Rocks. 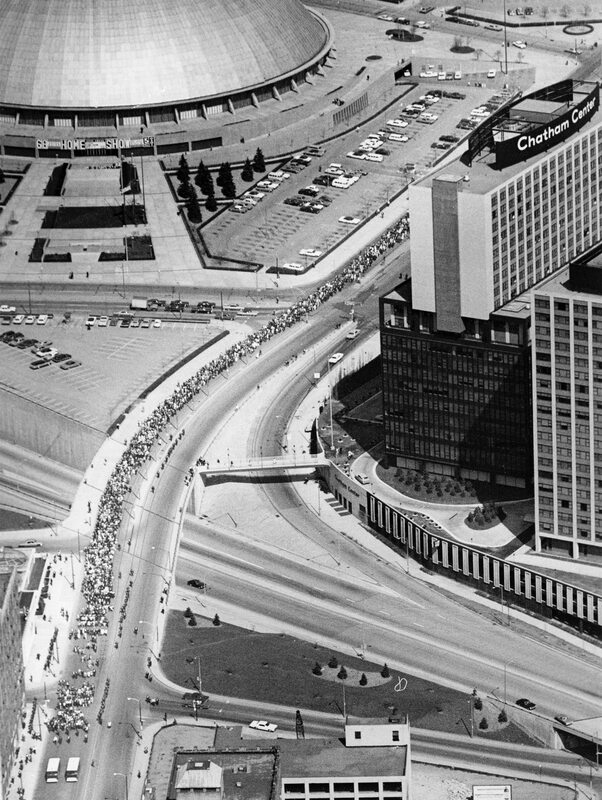 At the Civic Arena, Richard Gillcrese heard the news blare over the arena speakers: The Rev. Martin Luther King Jr. had been shot. People rushed to the exits. The Hill, they figured, was no place to be on this night. But the Hill was exactly where Richard needed to be. He’d grown up in the neighborhood before bulldozers arrived in the 1950s to demolish block after block of shops, clubs, homes and institutions central to the city’s black community. 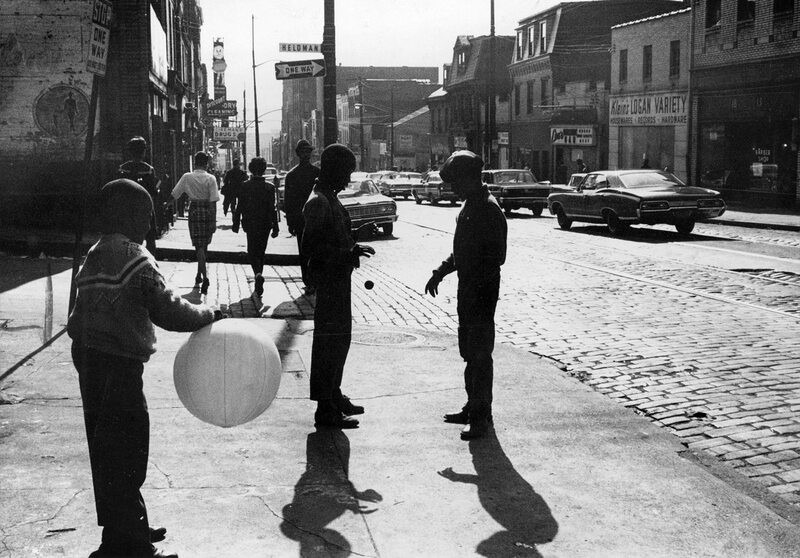 By 1960, urban renewal had claimed a 100-acre swath of the Hill that butted against Pittsburgh’s Golden Triangle. 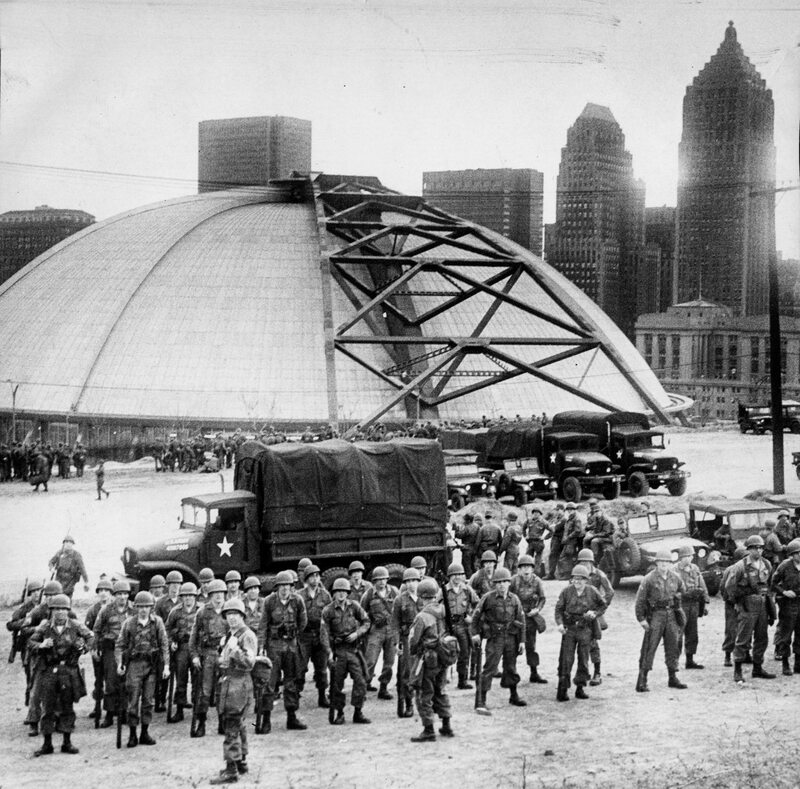 Seemingly distant and powerful forces had paved over a vital and historic black community and replaced it with an entertainment facility — the Civic Arena. Hill residents were left with a phantom limb ache that continued to throb more than a decade later. Richard walked up Centre, past St. Brigid and into a section of the street lined with storefront businesses — Milt’s Chicken Roost, Rendezvou Shine Parlor, Fireman’s drugstore. Residents shocked by the Rev. King’s death stood on sidewalks, openly grieving, exchanging news. A man stopped Richard and asked, “You know where Jonathan Zimmer is?” Zimmer was a young white man who worked for the Urban Redevelopment Authority and lived on Bedford Avenue. The man worried that if Zimmer were seen on the Hill, he might get hurt. 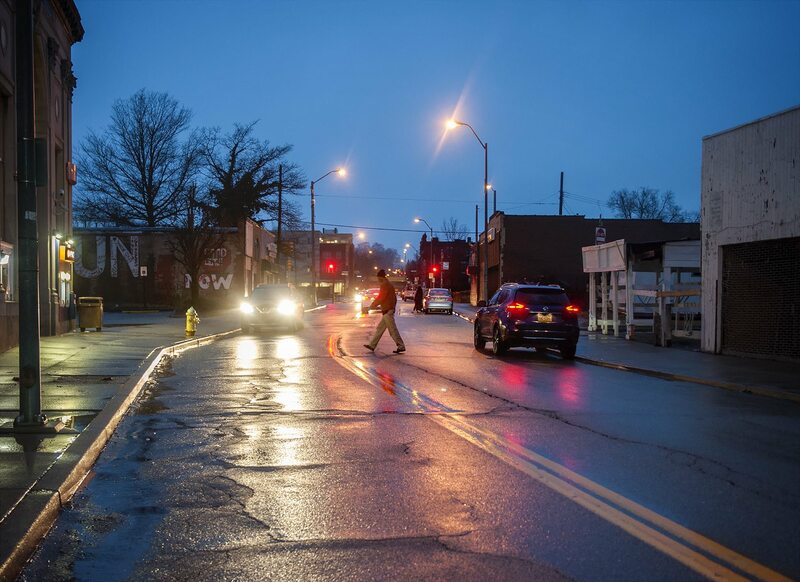 Richard walked the streets late into the night, looking for teenagers he worked with to make sure they stayed out of trouble. For now, the Hill seemed tense but calm. The next morning, Ralph Proctor visited Halfway Art Gallery, a common hangout. It was empty. He checked the offices of the NAACP and a few other places but had no luck finding friends in the movement. Go to Ebenezer Baptist Church, he was told. In Ebenezer’s dim sanctuary, Ralph came upon an extraordinary gathering of the city’s civil rights community. Conservatives, middle-of-the-road folks and militants packed the room, speaking in hushed tones. Some quietly wept, others embraced. “What do we do?” people asked. Some suggested a somber remembrance honoring the Rev. King’s nonviolent approach. Others strongly disagreed. 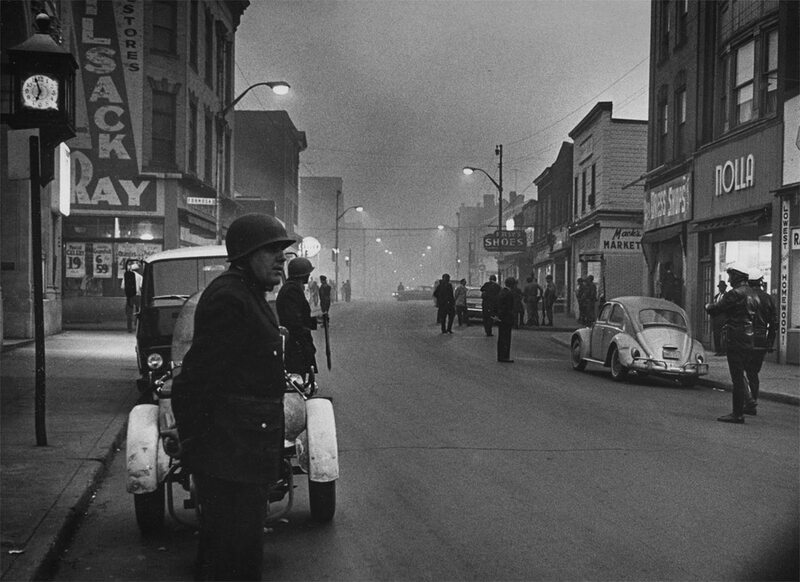 Dozens of cities had already burned as anger and frustration reached volatile levels in African-American communities across the country. 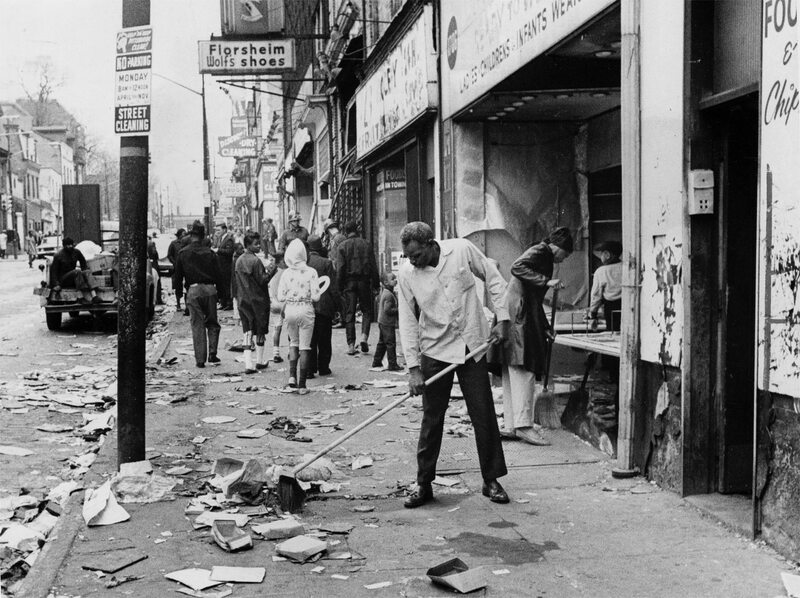 Harlem erupted in 1964, Watts in ’65. 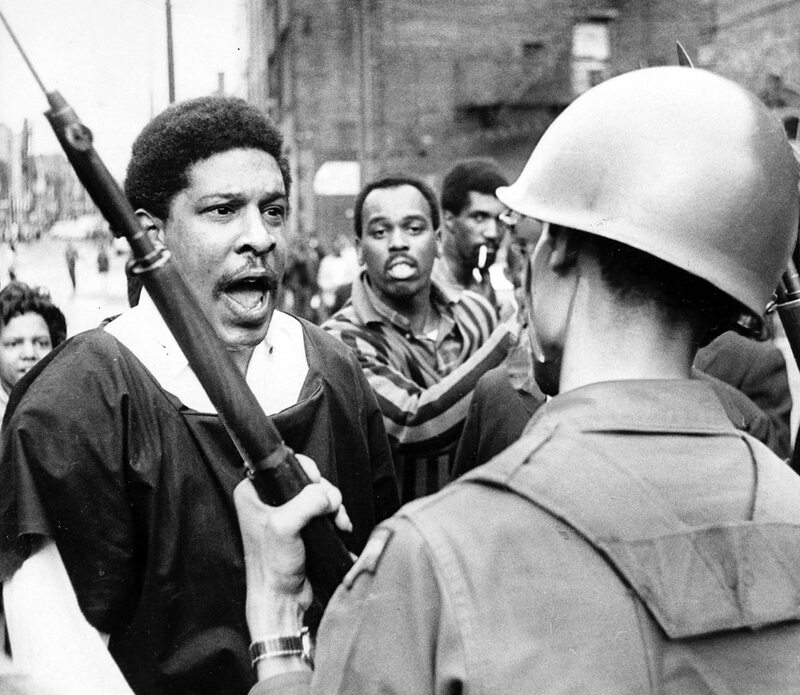 In June of ’67, rebellions flared in Atlanta, Boston, Buffalo and Cincinnati. July was the worst. 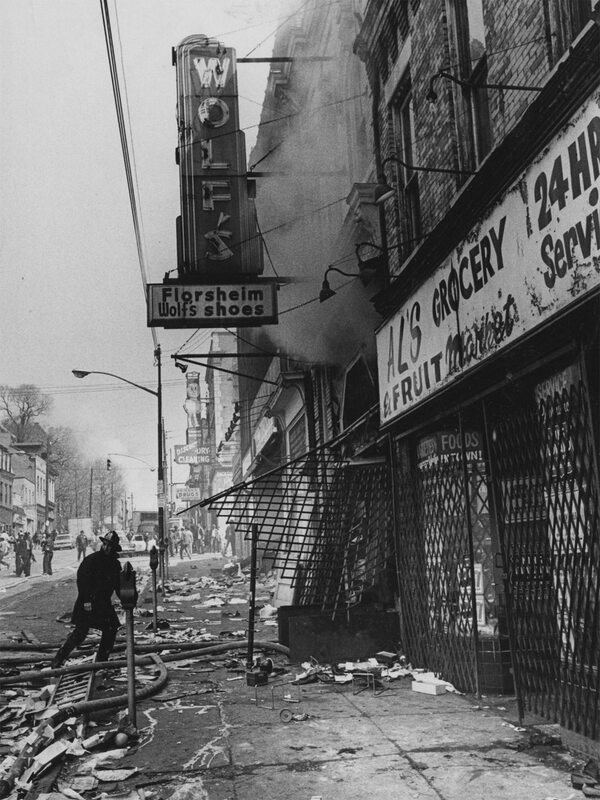 More than 70 died in uprisings in Newark, N.J., and Detroit. Milwaukee, Birmingham, Chicago, Minneapolis — all experienced some sort of upheaval. Yet Pittsburgh remained quiet. From the back of the room a voice called out, “If that’s all it takes, they got that.” A group of young men then left the church and headed toward Centre. Trouble started around 9:30 p.m., when a crowd broke into a meat market near the Zone 2 police station at Centre and Devilliers, newspapers reported. 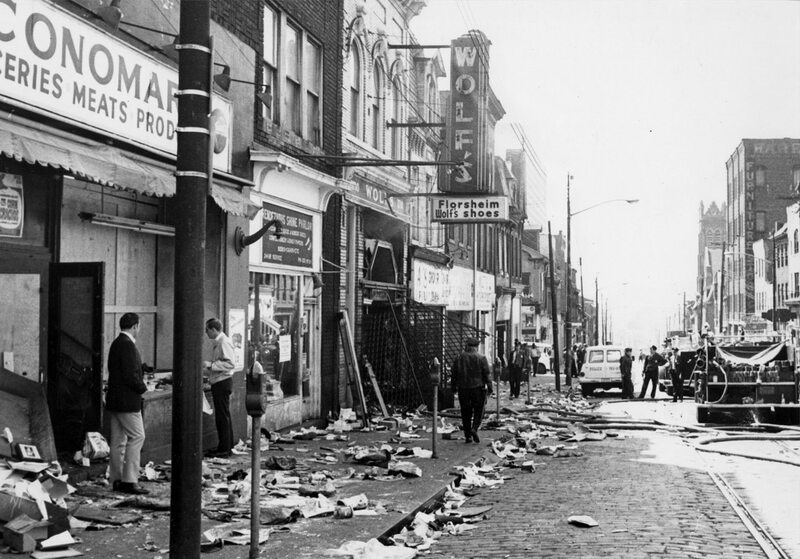 From there the crowd moved down Centre, shattering storefront glass, smashing windshields, ransacking stores. Police converged at Crawford and Centre to stop the group’s progress before it could reach the Downtown business district. A mile west, Louis “Hop” Kendrick made his way to the county narcotics department on the fourth floor of the City-County Building. Hop was one of several detectives called in to patrol neighborhoods outside city limits in case they, too, broke out in violence. Hop, 36, had grown up in the Hill. The department’s only black detective, he was considered by many to be the office’s outspoken troublemaker, determined to buck the expectation that black officers should keep quiet and do menial chores. As he entered the narcotics office, Hop heard his colleagues singing in celebration. Hop entered, furious. The room fell silent. A few officers said they had nothing to do with the singing. “You did nothing to stop it!” he shouted. Up on the Hill, more chaos. Windows shattered at furniture stores, clothing stores, grocery stores and pawn shops. Responding police heard the heavy thunk of rocks striking their vehicles. On Saturday morning, Brenda Robinson, now Brenda Tate, pushed her infant son, James, in a baby carriage past storefronts on Centre. Here, Brenda could buy whatever she needed — groceries, clothing, food, medicine. But not today. Shards of glass crunched under Brenda’s feet and the wheels of the carriage. Debris littered the sidewalks in front of stores now closed. At Centre Shoes, teenagers had squeezed past the iron gate covering a broken plate glass window. They tossed a few shoes onto the street. 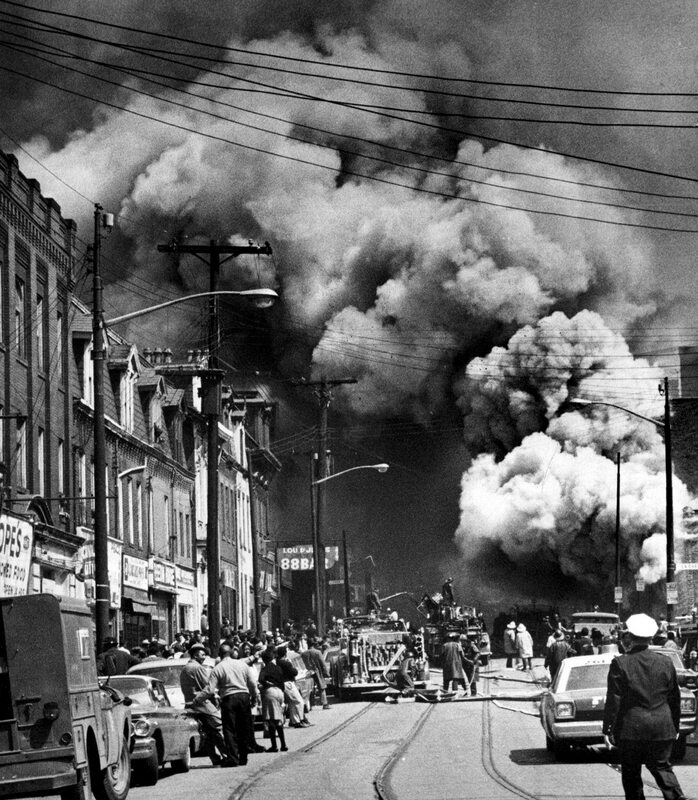 Later that day, fire bombs flew through store windows on Centre and on the North Side. Firefighters responding were pelted with rocks. A Perrysville Avenue drugstore burned. Stock boys put out flames at a North Side Giant Eagle. At nightfall, Pitt student Tony Fountain stood on the second-floor porch of his family’s home in the 2500 block of Centre, a few blocks east of the trouble, and looked out at his damaged neighborhood. On his mind were the demands he and other black students had discussed two nights earlier, but he was also concerned about the Hill. Tony understood the rage fueling the uprising. He’d been turned away from the main pool at South Park and sent to a smaller pool referred to derogatorily as the “inkwell.” Cab companies refused to enter black communities. And then there was his father, an educated man forced into manual labor. The Rev. 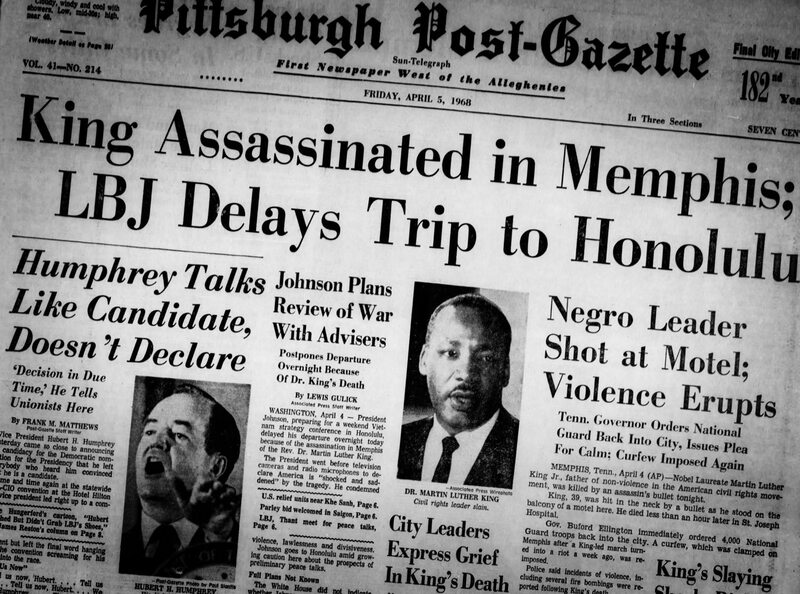 King’s assassination was a tipping point. As darkness settled over the city, Tony saw the glow of flames consuming stores and markets he’d known for years. By midnight Saturday, police in the Hill had rounded up several suspects and packed them into cells at the Zone 2 station. Inside, chaos reigned, according to a report produced by the Riot Fact Finding Committee at Fort Pitt Lodge 1 of the Fraternal Order of Police. A group of “known black militants” had been allowed into the station to “separate the good guys from the bad guys,” the report reads. Rank-and-file officers viewed this as “an overzealous attitude for the welfare of the rioters on the part of a black police sergeant” — the outspoken Harvey Adams. Hill District residents respected Adams for standing against racist actions by other officers and police brass. Outside, a crowd of several hundred made plans to storm the station and free the detainees. “A handful of police officers rushed the doors as the rioters were attempting to enter the station and succeeded in temporarily halting them,” the FOP report states. Officers requested that the district inspector release shotguns locked in a cabinet, but the inspector refused. He feared the weapons would fall into the hands of rioters. On Centre, Hop Kendrick watched an imposing African-American officer named William “Mugsy” Moore tell the crowd, “You’re not taking anyone out of the station.” On this night, anger ruled and his words had no effect. The next morning, Richard slipped a tie under his collar, tied it into a knot and headed to Palm Sunday services at Central Baptist Church on Wylie Avenue. He never made it to the sanctuary. He saw people attack a drugstore at Centre and Kirkpatrick and began walking in that direction. People carried armloads of meat and groceries down the street. The windows of Mainway, a modern supermarket on Centre Avenue, had been shattered. Richard knew some of the people were desperate, fearing food would become unavailable in the ravaged neighborhood. Ralph Proctor watched a young man approach the building and toss a fire bomb against a wall. The flames quickly petered out. He tried again with the same result. “Pretty soon, some older dude comes up behind him and smacks him in the head, takes a Molotov cocktail and throws it through a window and ‘foom,’” Ralph said. The Mainway fire sent clouds of black smoke into the air. People carrying goods hustled past police officers and finely dressed families fresh from Palm Sunday church services. Brenda Tate remembers that her mom, Bernice, was devastated by the burning of the Mainway. “Now where am I going to get 3 pounds of ground beef for a dollar?” she asked. About this time, Alma Speed Fox and her husband, Gerald, drove into the Hill after attending church services in Homewood. Alma heard on the radio that a planned march from the Hill into Downtown had been canceled. She patted her purse, where she’d stashed the march permit. The idea for a march originated with NAACP president Byrd Brown shortly after the Rev. King’s assassination. Alma, the organization’s executive director, quickly secured permits and organized groups and individuals who could help and participate. Alma and Gerald arrived at Centre and Crawford and joined a crowd ready to march Downtown. Blue-helmeted police stood shoulder to shoulder, blocking any movement down Centre. “You’re not going to march,” police announced. Alma made her way to the front, pulled the permit from her purse and showed it to public safety director David Craig. He’d been telling march leaders he could not assure their safety and the safety of the city. 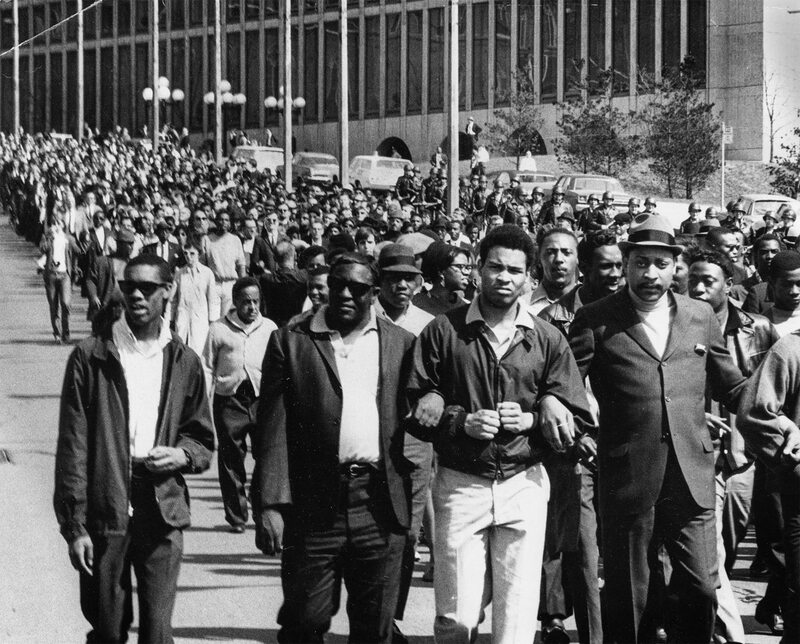 March leaders insisted they’d be nonviolent. After all, most in the crowd wore church clothes. Sirens screamed in the background as firefighters raced to put out fires just blocks away. Tempers flared. Men up front began pushing their way down Centre. A scuffle broke out between demonstrators and officers. Alma, dressed in a white dress and pearls, eyed a small space between the legs of a police officer. The crowd cheered — and laughed, says Richard Gillcrese. Police scooped up Alma and tossed her in the back of a paddywagon. “Let the sister go, let the sister go,” the crowd chanted. Moments later, authorities relented. Alma could go. “No,” she shot back. “You threw me in the wagon. It’s my wagon now.” She wouldn’t leave until the march was given the go-ahead. Back in the Hill, police radios sounded out. Get us some help to Irksteins Supermarket. We have a whole gang looting up here, about 1600 Centre. 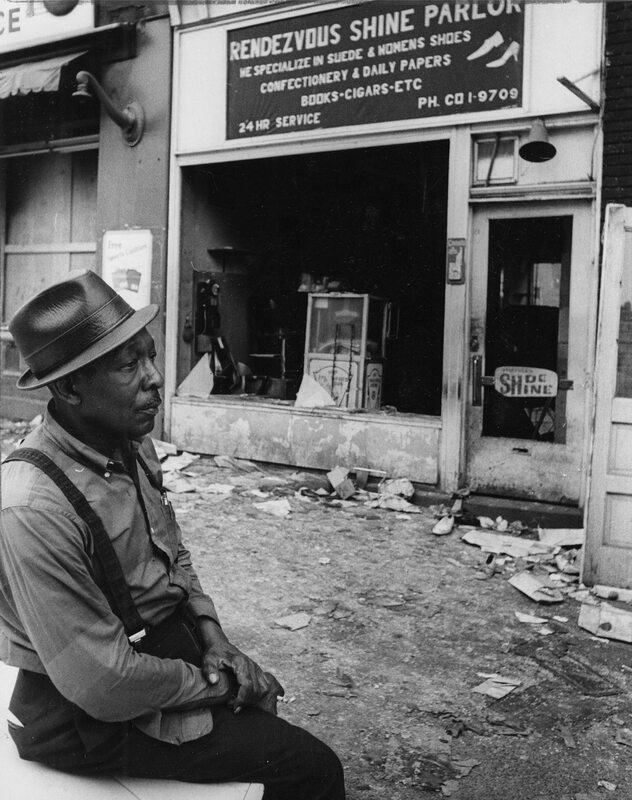 We have four stores that are broken out, front and back, and we have about 300 people and wholesale looting. Get us some help. We’re going to make some arrests. We need help at Kirkpatrick and Centre. We must have 3,000 people here and more every minute. They are looting to boot. I believe every unit in the Hill has been committed. Ralph hustled to the intersection of Centre and Kirkpatrick Street. The targeted paint store was on the first floor of a red brick building there, and Irvis lived in a second-floor apartment. By now, other members of the civil rights movement had arrived. Irvis pleaded with them to do something. 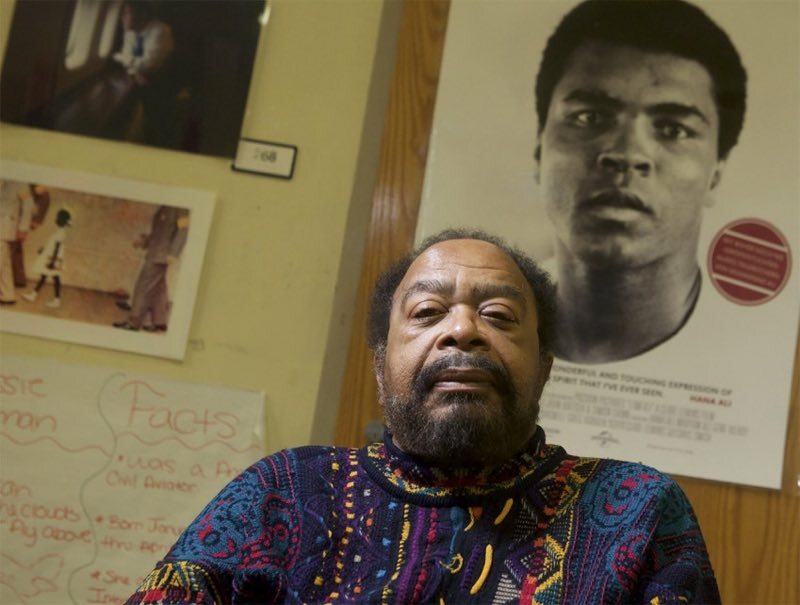 Sala Udin’s four years of organizing work in the South had earned him considerable respect in the city’s black community. He climbed atop a car and tried to calm the crowd. It had no effect. The crowd waited while Irvis secured a truck. Then he and a few others, including Curtiss Porter, the Pitt senior who had helped form the Black Action Society on Thursday night, climbed a narrow stairway and into an apartment filled with African art — pictures and wooden figurines. The men carried Irvis’ belongings down the steps and loaded them into the truck. Smoke rose from the building as the truck pulled away. Sunday evening, Alma and Gerald Fox sat at home watching TV news. 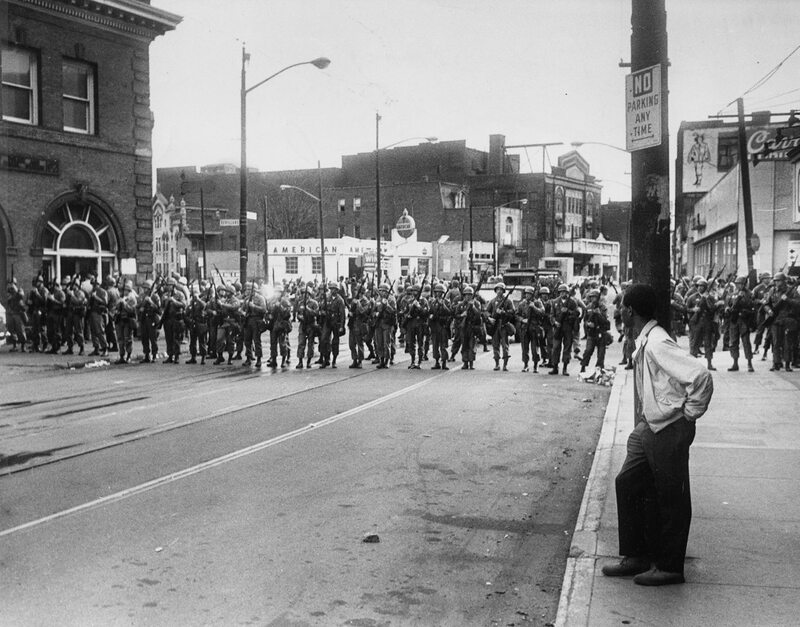 An image flashed across the screen: a young African-American man angrily confronting a National Guardsman on a Hill District street. The guardsman, facing away from the camera, held a rifle to his chest. A small band circled his wrist. 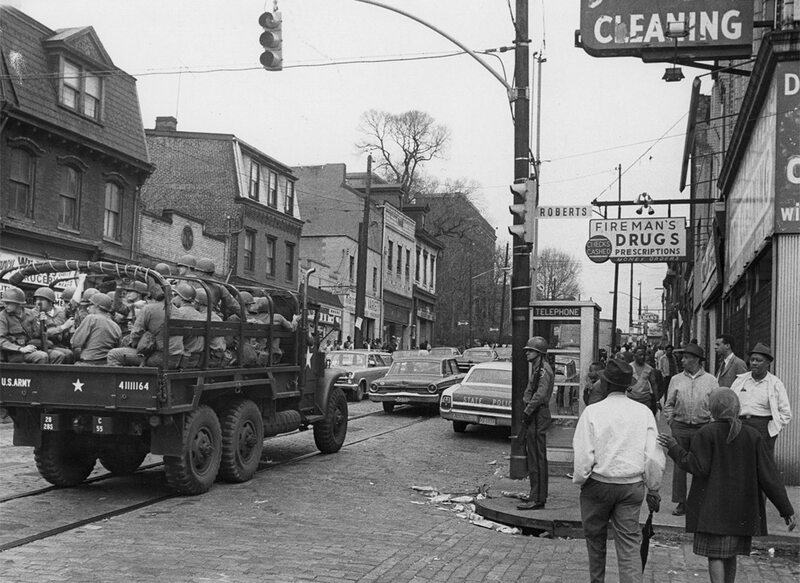 Carl Fox, Alma and Gerald’s son, had just completed two weeks of National Guard duty in Harrisburg and was driving a military truck in a caravan of vehicles headed back to Pittsburgh when he got the news: The 107th Artillery Battalion would assist police in Pittsburgh. Carl, one of few blacks in the unit, soon found himself on the front row of a line of guardsmen on Centre and Crawford, where his mother had confronted police earlier in the day. Bricks and bottles rained down on the guardsmen as they advanced up Centre to Devilliers Street, directly in front of the Zone 2 police station. There, the guardsmen formed a line that stretched across the road. It was Tamanika Howze’s brother, known in the neighborhood as “Brother Phil.” He was active in the community and once worked to convert a vacant lot on Tannehill Street into a playground. “Why are you standing up for the white man?” he asked Carl. Someone spit on Carl. “How much do I have to take?” Carl wondered. Later that day, Ralph Proctor looked out a second-floor window of his parents’ house on Wiley Avenue and watched an Army jeep roll down the street on which he played as a child. In the back stood a National Guardsman with his hands on a .50 caliber machine gun. As darkness arrived, Tim Stevens, 22, held a rifle and sat in a chair in the driveway of his family’s home on Wylie Avenue. Earlier, someone had attempted to fire-bomb a white-owned market abutting the Stevens house. Tim intended to ward off anyone wielding a Molotov cocktail, though in truth all he could do was shower attackers with lightweight plastic orbs. On Monday morning, residents and store owners swept debris from the sidewalks. In Wolf’s shoe store, blackened by fire, a 10-year-old boy picked through the rubble, hoping to find a salvageable pair of shoes. A block away at Eisenstat Candy Co., an ankle-deep layer of squashed candy, novelties and tobacco covered the floor. 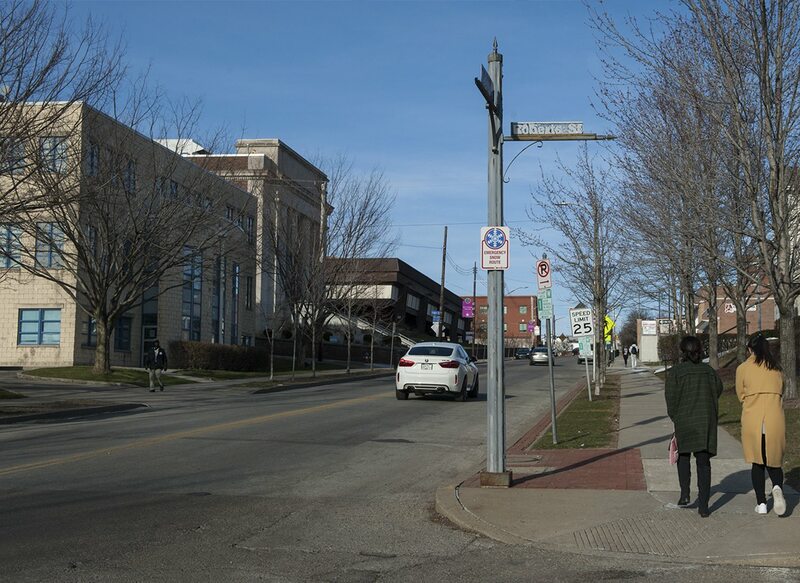 Many business owners told a Pittsburgh Post-Gazette reporter their shops were uninsured -- insurance companies had refused to renew expired policies. Later in the day, smoke rose over Homewood, 5 miles east of the Hill. Burning and destruction there reached its peak between 3 p.m. and 7 p.m., then diminished. Police and guardsmen blocked major intersections, checked motorists’ IDs and searched for weapons. Tony Fountain had no problem getting past checkpoints in the Hill. His father, Morris, operated a funeral home in addition to working as a janitor. Tony cruised the city in a station wagon often used to fetch bodies from hospitals or the coroner’s office. At roadblocks, police peered in the back of the familiar vehicle, saw a gurney and waved Tony through. In the days after the Rev. King’s death, demonstrators had set 505 fires, mostly in the Hill. Police made 929 arrests. Property damage surpassed $600,000. During the mayhem, Brenda Tate and her boyfriend, James, had picked up some brisket dumped on a sidewalk. Why let it go to waste? But in the following weeks, she felt shame mingled with anger and sadness. 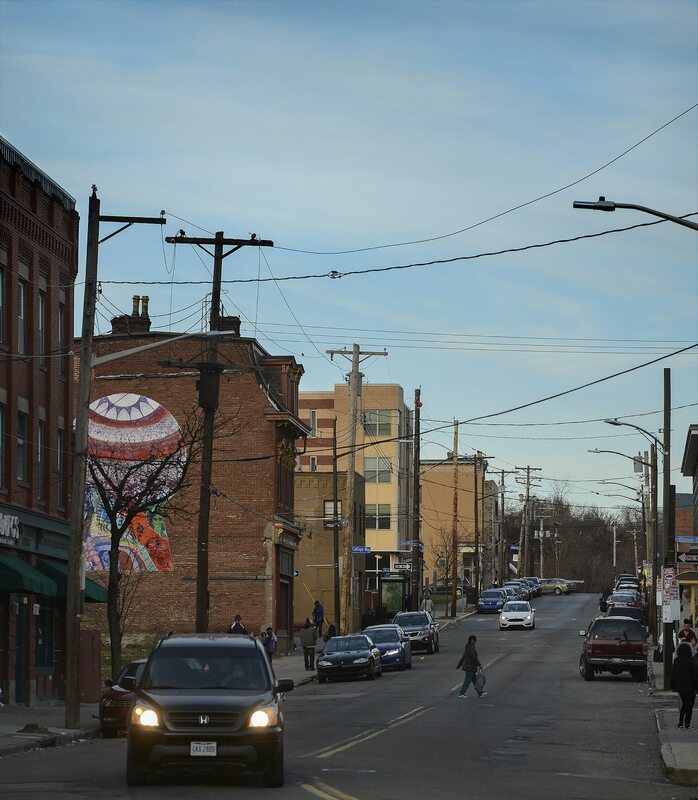 The Hill, already torn open by urban renewal, slumped into poverty and despair. The community’s drug problem picked up “because of the hopelessness” the devastation created, Brenda says. It felt as if the community had lost something deep. But Pittsburgh gained something, too: a cadre of angry and determined activists. At Pitt, chancellor Wesley Posvar quickly met a few of the demands of the newly formed Black Action Society. Fifty additional black students began classes in fall 1969. Months later, the BAS occupied the university’s computer center, forcing Posvar’s hand on other issues. He signed an agreement to recruit additional black faculty and personnel and establish a black studies department. Though the Rev. 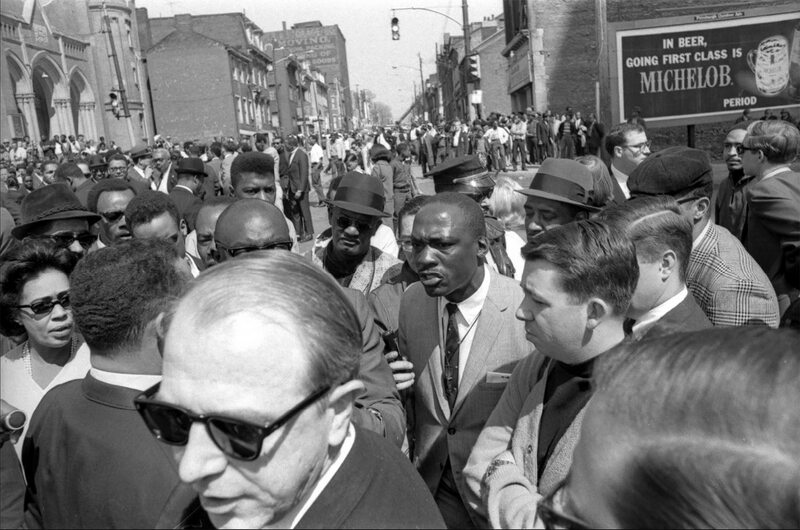 King’s murder robbed the civil rights movement of one of its most thoughtful and effective leaders, people emerged from the smoke and fire in the Hill with “a fire in the belly to do something, to deal with community rights, civil rights,” said Tim Stevens.